Some of the best Hyperspectral imaging system created today are used to conduct a thorough quantitative spectral study of nanoscale materials. On close scrutiny, you shall observe that hyperspectral pictures look akin to a conventional optical image. However, there remains one key differentiating factor. Should you examine the image with a software, you notice that every distinct pixel offers an entire spectral response of its own spatial area inside of the spectral range. In fact, ever since the invention of hyperspectral imaging, it has been regarded as a technique that has shown the most potential. This is primarily due to the fact that it combines the advantages of imaging with the best of spectroscopy practices! The CytoViva Hyperspectral Imaging System evolved from technology originally developed for aerial based imaging applications within Department of Defense and NASA. CytoViva has adapted this technology to operate as a proprietary, integrated system with its patented microscopy technology, enabling spectral quantification of materials and live biologicals at the nanoscale. This can include spectral analysis of both biological and materials-based nanoscale samples, which may be isolated or integrated in cells, tissue or other materials-based matrices. CytoViva provides hyperspectral imaging in the visible near-infrared (VNIR 400nm-1,000nm) wavelength ranges as well as in the short wave infrared (SWIR 900nm-1,700nm) wavelength ranges. The CytoViva advanced darkfield illumination system replaces the standard microscope condenser. The specialized illuminator focuses fixed-geometry, highly collimated light at oblique angles on the sample. This serves to dramatically improve contrast and signal-to-noise ratio which allows for optimized resolving power and detection capability of non-fluorescing samples. 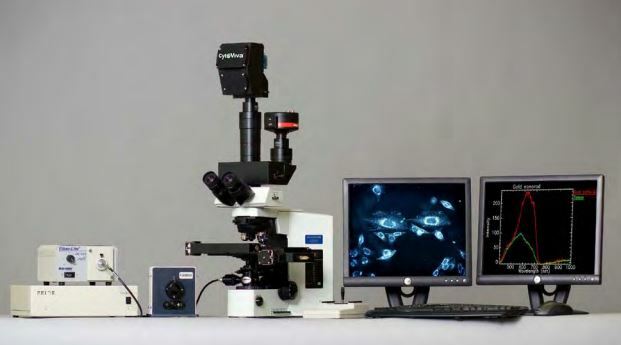 The CytoViva 3D Enhanced Darkfield Imaging System provides a method for locating non-labeled nanostructures (particles, tubes, etc.) in a variety of translucent matrices (cells, tissue, organisms).